Lady Mary Anne Forester's (1831-1893) will provided for legacies of £120,000 and the residue of some £400,000 was "to be applied for the purposes of establishment of a Cottage Hospital at or near Wenlock in the County of Salop and of a Convalescent Home at some seaside town or place, to be decided upon, as memorials respectively to my said husband George Cecil Weld, third Baron Forester and called respectively the Forester Cottage Hospital and the Forester Convalescent Home". The Convalescent Home was built at Llandudno and the Trustees of Lady Mary Anne's estate agreed to purchase a piece of land from the Milnes Gaskell's of Wenlock Abbey for the Cottage Hospital. The land was situated at the edge of Much Wenlock and near to the railway station. The plot was eventually purchased in 1898 for the sum of £1,100. The building of the Cottage Hospital was opened in 1903 and its story is detailed in Valerie Roberts' comprehensive booklet "The Story of Much Wenlock Cottage Hospital" from which excerpts are reproduced here with the author's kind permission. The next 88 years saw many changes, including the advent of the National Health Service in 1948, until 1991 when the closure of cottage hospitals became inevitable. 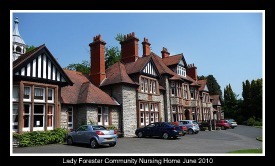 On 31st March 1991 the Lady Forester Memorial Hospital at Much Wenlock closed and on 1st April 1991 the Lady Forester Community Nursing Home opened. In 1996, however, the Much Wenlock Nursing Home Trust realised it would be unable to run under changing circumstances within the NHS. The ExtraCare Charitable Trust was asked if it would take over the Nursing Home to which it agreed. It bought the old hospital building and part of the grounds from the Secretary of State. They were anxious to extend the nursing Home but their charitable status did not allow for sufficient funds to be available. A national and local appeal was made under the patronage of Lady Catherine Elizabeth Forester and chairmanship of Councillor Milner Whiteman, then Mayor of Much Wenlock. The Much Wenlock Nursing Home Trust handed over their assets of £265,000 and the League of Friends provided another £33,000. A total of £500,000 was raised due to the hard work of patrons and committee towards a fine building with ten ExtraCare housing flats - Foresters Court. In 2010, ExtraCare announced that it was considering closing the Nursing Home and selling the site for housing development. A vociferous campaign, spearheaded by Much Wenlock Town Council, succeeded in not only ensuring that the Nursing Home was sold to. an experienced proprietor, English Care Ltd, but also in securing a donation of £250,000 from ExtraCare back to the Much Wenlock community in recognition of the money raised in the past. This capital sum was used to form the Much Wenlock Forester Charitable Trust (MWFCT).